Also Called: Nodding bulrush, reddish bulrush. Culms: Erect, slender, firm, triangular. Leaves: 5-10, flat, to 1/3 inch wide, firm, pale green, widely separated on culms; margins rough. Inflorescences: Umbel-like, 6 to 8 inches long, consisting of 1 terminal, sessile cluster of spikelets and several slender-stalked spikelets at ends of umbel rays that frequently droop at maturity; bracts several, leaf-like, brownish. Spikelets: Numerous, oblong-cylindric, to 2/5 inch long, turning reddish brown with age; flowers perfect; scales ovate, light brown; midribs prominent, green; tips pointed; bristles 6, at bases of flowers, pale, nearly glabrous, about twice as long as achenes; stamens 3; styles 3-cleft. Fruits: Achenes, oblong, pale brown, short beaked, 1-seeded. Habitat: Marshy or swampy areas, damp prairies and meadows, edges of streams and ponds, and wet ditches. Uses: Waterfowl eat the seeds. 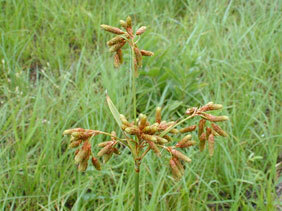 Comments: Pendant bulrush tends to grow in loose colonies.